One of Michael Moreci's many writing talents besides dialogue and plotting is setting the tone. In 'Roche Limit Clandestiny' #2, he sets the tone early with mind-blowing terror. It's the unnerving opening sequence that grabs you and puts you right back on Dispater with the investigating crew who have their hands full with...whatever lurks in the dark. The latest installment has all the sci-fi horror action you'd want in a comic. We knew after issue one that things weren't all they seemed on Dispater and it was going to take some exploring to uncover some unsavory things. We're rewarded quickly with action and danger, but it's the group's dynamics that take precedence. Kim's character development especially comes into focus with an effective flashback. A stark contrast to the desolate and foreboding landscape of a once thriving planet. Both scout groups had run-ins with unknown parties and have to regroup quickly. The stage is set for more dangerous exploration but now have the android Hello Danny to help with repairs and understand what has happened to this world. Any good comic book writer will tell you that one of the most important things to do is assist your artist in maximizing his/her talent. You want to make sure you set him up with some clear instructions, but you also have to know when to let him fly. Luckily for Moreci, Kyle Charles and Matt Battaglia are a great art team capable of some outstanding cinematic pages. Their attention to detail and color schemes give 'Clandestiny' a unique and appropriate other-worldly appearance. From foliage to clothing, Charles goes above and beyond what is needed to bring the scene to life. Battaglia could have easily settled for dark blues, grays and black to create the eerie environs of the planet at night as the crews explored it, but instead we get brilliant purples, rusty oranges and sometimes some evergreens. It still conveys the sense of dread but with an eclectic palette of color. One of the most impressive scenes is when they woke the unconscious Kim and we get her perspective as she awakens to a blurry and unintelligible world. A great example of the artists working in tandem to elevate the story. It's easy to make comparisons to movies like Aliens and Predator. 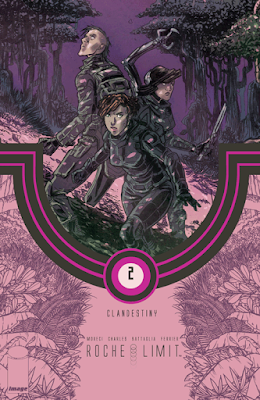 Those movies brought something special to science fiction and Roche Limit Clandestiny brings something special to comic books. A great space mystery with suspense and action that keeps you hanging on every page. Moreci and company are giving you the sci-fi fix you need.